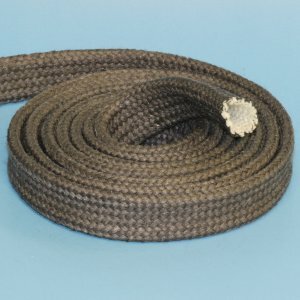 This high temperature, heat and flame resistant and thermal insulating graphite coated braided fiberglass sleeve will withstand temperatures of 1100°F / 593°C continuous exposure. The base high temperature and heat resistant braided fiberglass sleeving is fabricated from high quality type E fiberglass that will not burn. The sleeve is then coated with graphite, adding lubrication and additional protection from splatter and molten metal attachment. This high temperature insulation sleeve protects wire, cable, hose, pipe and tubing, along with providing energy savings and personnel protection.